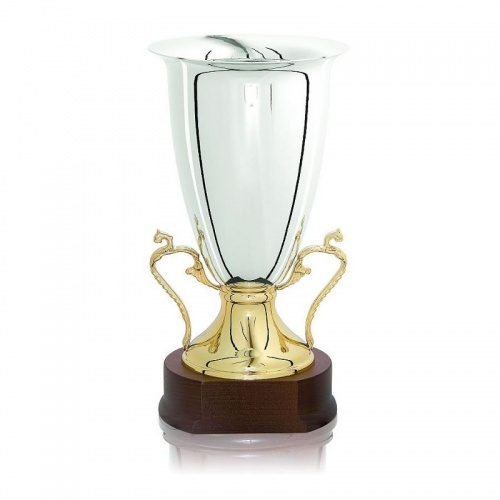 A classically styled trophy with urn shape body in silver plated finish set on a gold plated foot with elegant decorative handles, all mounted on a solid wood base. Standing 12.5in tall, these distinctive trophies can be engraved an engraving plate attached to the base. These trophies are exclusive to this website in the UK. This was an award set up in memory of a recently deceased member of the faculty, to be awarded to any one staff member who had contributed a significant amount to the students during their time here (Lifetime Achievement Award). The urn was thus symbolic and the simple design very fitting. Looking back, we should have ordered a smaller size but the gold handles contrasting with the silver body make this an especially striking design.